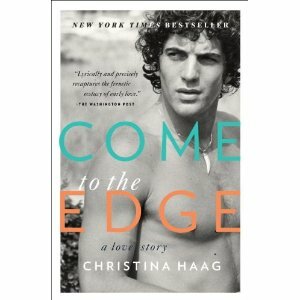 Come to the Edge: a love story by Christina Haag recounting her relationship with John F. Kennedy, Jr.
Come to the Edge is a memoir, written by actress/author Christina Haag. This book arrived on my doorstep because from time to time I participate in a book club/Twitter party with Andrea Katz, of Great Thoughts. Andrea must have me on her “nice” list, because when this book arrived in the mail for me, it had been personally autographed for me by the author, with a simple note on the title page, “For Susan: Enjoy! Christina Haag”. Now, I ask you: wouldn’t you be intrigued if you received a book with a lovely personalized note from the author on the cover page? And the next thing I discovered: the author was the former girl friend and the “compass” of John F. Kennedy, Jr. Hello? That beautiful young man, the son of America’s most romanticized president, the guy that People magazine declared one year to be the sexiest man alive? And now his former love is ready to share her memories in regard to their story of young love? Christina Haag’s book was every bit as personal and engaging as I could have hoped it might be. She mentions in the book that John told her how he treasured her letters, keeping every one, and to me, after reading her memoir, that’s quite easy to imagine. I truly enjoyed her writing style. As she described the poignancy of the beginning of their relationship, I was carried back to the exquisite feelings I had when first falling in love. There’s nothing quite like it, is there, when you first discover that the feelings of longing that you have kept secret in your heart for that special someone are actually requited? She tells her story beautifully. I think the thing that I liked most about this book was the courage that went on behind the scenes that led her to tell her story. In my opinion, it took great courage for Ms. Haag to examine her life in such an open manner. for it has doubtless led to public criticism by some folks. I also find it extremely courageous that she tried her hand at doing something completely different with her life other than what she had done up until this time, which was acting. And if you go by the external measurement of the book being a NY Times bestseller, her efforts have met with rip-roaring success. I will confess that it did take me a while to get through it, but only because I love history, and I kept stopping to google people and places she mentioned within the book. When she would describe John’s mother, the beautiful Jacqueline Kennedy Onassis, for instance, I wanted to go find videos on youtube, so that I could actually hear Mrs. Onassis’ voice. I wanted to again see pictures of Caroline Kennedy, and her wedding dress. This is recent history: these are things I can remember, very well, and it helped make the story even more real to me, to further research some of the people and places she mentioned in the book. The only aspect of the memoir that I didn’t enjoy as much, was that Ms. Haag has not elected to tell her story in a strictly chronological order. I get it: it’s her memoir, and a memoir is not bound by the constraints of an autobiography, and so therefore need not be in chronological order, but my preference would have been for a more orderly telling. I like to see the connections between events, and how one thing very often leads to another. That said, I enjoyed this book very much indeed, and recommend it wholeheartedly, especially to anyone who enjoys a romance, or to anyone who is a bit of history junkie. I’d love to hear your thoughts: Were you as intrigued by the Kennedy family as I was when I was growing up? What do you think of, when you think of young JFK Jr., and the Kennedys? Even though I was given this book, all opinions are very much my own. My friend Mama Kat asked for a book review on her writing prompts this week, and, as it happened, I had this one ready to go, already in the hopper, so to speak. If you’d like to read other wonderful book reviews, or just some great stuff, click on the box below, and you’ll be magically transported to some really fine offerings.